A.J. Muste was an immigrant to the United States of America, as the 19th century slowly became the 20th, but he didn’t have much say in the matter as he was only six years old when his parents moved from Holland. He received a fine education and was a proud resident and citizen of the nation of his parents’ choosing. He graduated with honors first with a bachelor’s degree and eventually with a master’s and doctoral degree. As he matured, he became increasingly involved in social causes even as he tried to figure out the question of his own spiritual calling. He was especially involved in the labor movement and helped organize disenfranchised workers together so that they might negotiate with their employers for a safer and better job. As was expected, he received much resistance from the circles he had been raised in and in which his parents circulated. Yet, he was convinced that he must do something for those in need of help and for the cause of justice and fairness. So, he was willing to sacrifice a good reputation for his convictions. Eventually, he became a minister in a congregational church but he was committed to non-violence after his experience of World War I and the people whom he met with and with whom he conversed. This was an odd stance for a man such as A.J. but it became a hated stance as he persisted in it through the years approaching and including World War II. But, he was convinced that God had called him to a way of peace and nonviolence that revoked any right he felt toward self-defense or preemptive violence. By A.J.’s reasoning, there was no just war and so not even World War II could be rationalized or accepted. When a son of a member of the congregation where was pastor died in the war, he did not veer from his intended topic for the Sunday sermon: “The Futility of War.” It was another opportunity for him to raise his famous question: “The problem after a war is the victor. He thinks he has just proved that war and violence will pay. Who will now teach him a lesson?” By A.J.’s thinking there was no time when war or violence would pay or would be acceptable. When he had saied this, he must have known he would suffer for it. That afternoon the congregation called a meeting and voted to terminate him as their pastor.He, his wife, and his children were forcibly moved out of the parsonage that night and had to find somewhere else to live. 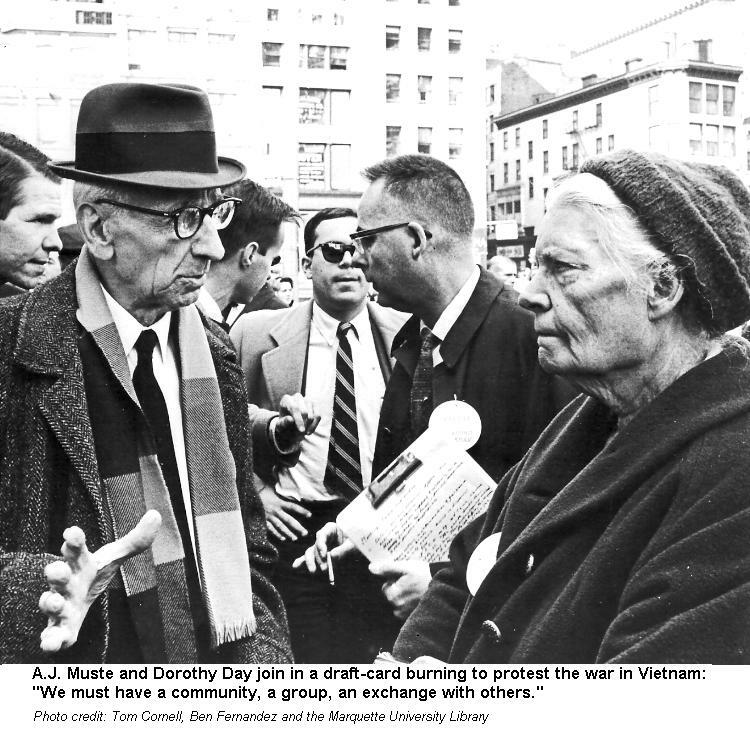 He remained a minister, associated finally with the Quakers, and committed to nonviolence even if it had cost him his job. He was at one time an advisor to Martin Luther King, Jr. and considered an authority on nonviolent resistance. He and his colleagues and associates were arrested repeatedly for hopping fences at military facilities, paddling their boats into nuclear test sites, and sympathizing with those whom the State insisted they hate and fear. For these things, A.J. received and still receives derision but he could not more veer from these convictions than he could stop being who he was. He had become an advocate for peace and nonviolence at all costs and had proven repeatedly that he was willing to lay down anything for a chance at peace. If it is true that the peacemakers are blessed–and I do believe it so–then surely A.J. Muste has a share of blessedness for his refusal to abandon the way of peace even in the face of adversity. The angel said, in a voice both soothing and discomforting, “All your prayers and gifts offered in ignorance have made their way to God. So, send some people to Joppa to find a man named Peter–they’ll find him in the home of Simon the Tanner–near the sea. After God’s messenger faded into the crowds surrounding Cornelius’ home, he called two of his servants with a shaky voice and one soldier who was like him in prayer and the giving of alms. He told them what had happened with a mix of fear and hopeful anticipation and then sent them to Joppa to do their part in the unfolding story. Perhaps thinking this was a test, Peter said, “You know I won’t do that, Lord. I don’t eat what you have labeled unclean. They responded, “Cornelius has sent us to find you. He is a good man who fears God and is highly respected among the Jews. He received a vision and one of God’s messengers told him to seek you out and hear what you have to say.” Peter took the men into the home and made them his guests and when the sun rose again, he and some of his fellow Christians went with the men back to the home of Cornelius. 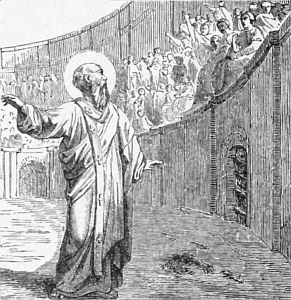 Eventually, they reached Caesarea and found that Cornelius had prepared quite the event and audience to hear Peter’s words. As Cornelius’ messengers went out seeking Peter, he had become anxious and eager to hear what words might come. So eager was Cornelius to know how and who he should worship, he fell at the feet of Peter and offered worship on the spot to Peter. Peter tapped him on the back and said, “Not me Cornelius. I’m human just like you.”Cornelius led Peter in to meet the audience and when Peter saw all the ones gathered to hear him, he remarked, “You all know well how Jews do not associate with other nations and have strict laws concerning purity. Well, God has shown me that no person is unclean.So, when Cornelius sent for me I came quickly without knowing why. 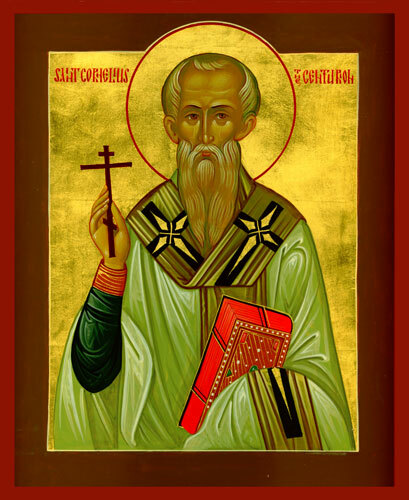 I was responding to God’s guidance, what were you doing?” Hearing this, Cornelius told the story of the vision and the message and asked Peter if he would be so kind as to share what God had laid upon his heart. But there was more to it than words. While Peter was speaking, the Holy Spirit fell on Peter and upon the audience and redemption and salvation came very near to the audience who found themselves transformed by the gospel message of forgiveness and life in the face of sin and death. The fellow Jewish Christians that came with Peter were surprised to see Gentiles receiving the Holy Spirit. But they couldn’t deny that the gentiles were speaking in tongues and offering praise to God who had made Jesus Lord of all. 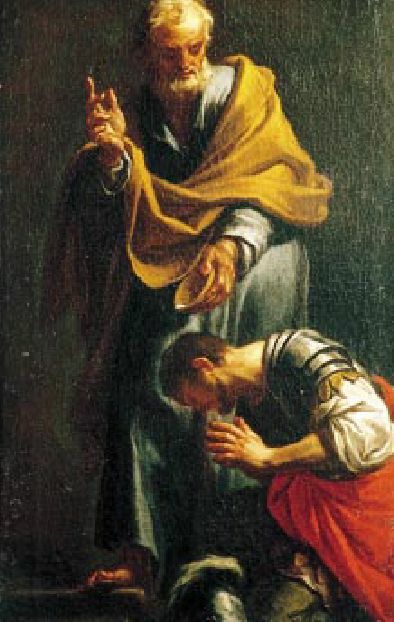 Peter turned to his fellow Christians and said, “Surely none of you can hold the baptismal waters hostage from ones such as these men and women who have heard the good news and been filled with the Holy Spirit.” So, they were baptized in the name of their Lord and Savior Jesus Christ and Peter remained with them for a while.